Today is the 2014 Virginia Festival of the Book’s Annual Book Fair! I will be at the Charlottesville Omni Hotel, signing copies of the book for ten dollars – a 25% savings off Amazon! If you’ve come to the site from the address on the bookmark, the first chapter is available for free. Click the ‘free excerpt’ link to the right. Enjoy! This entry was posted in Announcements and tagged Dragonslayers 1 on March 22, 2014 by Matt Maynard. The Virginia Festival of the Book starts today and runs through this Sunday. I will be at the Annual Book Fair this Saturday, March 22nd, from 9 AM to 4 PM at the Omni Hotel on the Charlottesville Downtown Mall. Signed copies of The Dragonslayers, Volume 1 will be available for $10, a 33% discount off of the list price. Come by and get your copy! 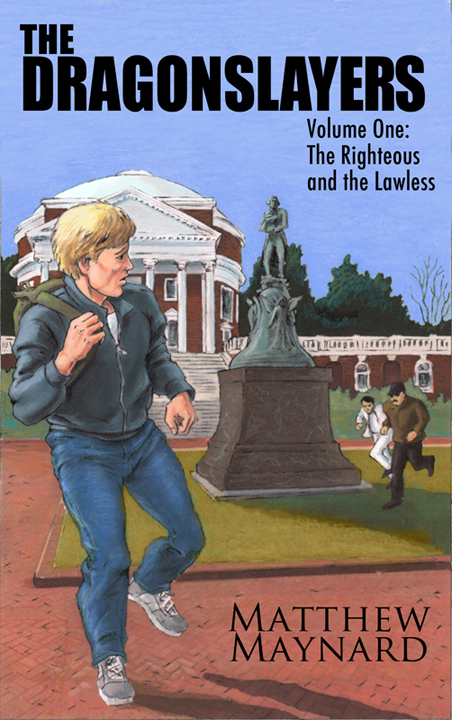 I’m also working on putting together a couple discussion groups in Charlottesville that will feature character sketches, readings, and discussions about the War On Drugs and Liberty Fiction in general. Watch this space or join the Mailing List to learn more. This entry was posted in Announcements and tagged Dragonslayers 1, Public Events, VABook on March 19, 2014 by Matt Maynard. The Dragonslayers, Volume 1: The Righteous and the Lawless, by Matthew Maynard, is now available in paperback and Kindle formats from Amazon.com. After marrying his high school girlfriend in 2004 they moved to Virginia, where he continued his career as a programmer and developed his skills as a writer in his spare time. His first novel, The Dragonslayers Vol. 1: The Righteous and the Lawless, was born in the mayhem-filled month of November 2010 during National Novel Writing Month. Four years, several revisions, and one child later, he finished the manuscript. It is available through Amazon in paperback and Kindle formats. The author promotes his writing at his website, www.MatthewMaynard.net. He will be available at the Annual Book Fair for the 2014 Virginia Festival of the Book on Saturday, April 22nd, 2014, signing copies of his new release. The event will be held at the Omni Hotel, 212 Ridge McIntire Road, Charlottesville, Virginia 22903. This entry was posted in Press Releases and tagged Dragonslayers 1 on March 17, 2014 by Matt Maynard.